The AGGREGATE function is one of the math and trigonometry functions. The function is used to return an aggregate in a list or database. The AGGREGATE function can apply different aggregate functions to a list or database with the option to ignore hidden rows and error values. function_num is a numeric value that specifies which function to use. The possible values are listed in the table below. options is a numeric value that specifies which values should be ignored. The possible values are listed in the table below. ref1(2) is up to 253 numeric values or a reference to the cell range containing the values for which you want the aggregate value. Note: if you want to use one of the following functions: LARGE, SMALL, PERCENTILE.INC, QUARTILE.INC, PERCENTILE.EXC, or QUARTILE.EXC, ref1 must be a reference to the cell range and ref2 must be the second argument that is required for these functions (k or quart). The figure below displays the result returned by the AGGREGATE function when the SUM function is applied. The figure below displays the result returned by the AGGREGATE function when the LARGE function is applied, ref1 is a reference to the cell range, and k is equal to 2. 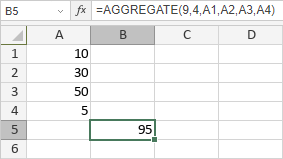 The function returns the second largest value in cells A1-A4.